Projects: A specific music collaboration, most often used for the purposes of one song recording. Group & Project Admin: Is the user that created the group and correlating Project(s) within, and will have administrative capability to manage all members and projects within the group, and projects. There can be a co-admin. Groups: A collection of artists that have formed to create projects together. Not all members of the group will necessarily participate on all projects within the group, but will be informed of all ongoings of group activity. Think of a ‘group’ similarly as ‘band’. Artists: Majority of usage is directed at content creators, specifically the Performing Musician, Singer Songwriter or Engineer/ Producer, upon sign-up the user provides a user name, which will displayed on the Artist Profile page. If the user wishes to change this display name to to their ‘Stage Name’, a user can make this edit on their profile page. The Artist profile page also indicates the primary role the Artist plays within the song-recording and production process: Performing Musician, Singer Songwriter or Engineer Producer. Mixes: A multiple voice performance audio file. 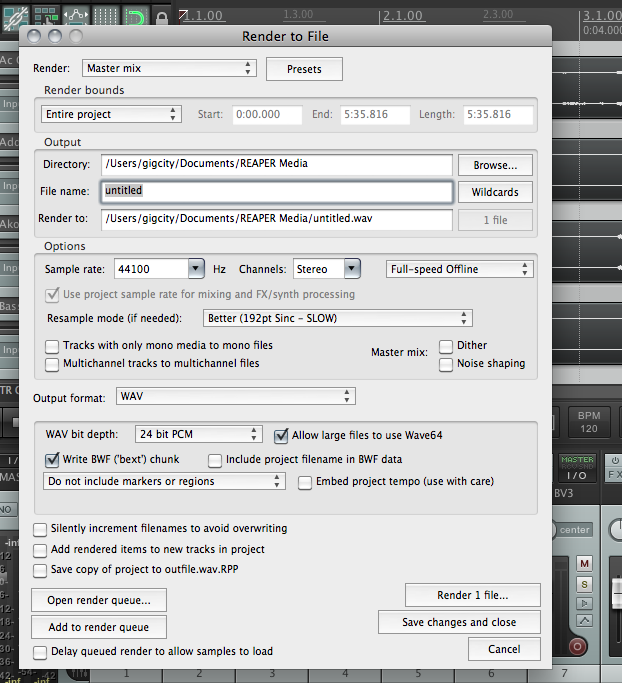 For example, a combination of a number of stem tracks mixed down into one file or song for playback. An uploaded mix in raw state will only be made available for the user that has uploaded the file, or the group and project members that the file has been assigned to. A posted mix is a version made available to the community. When a user posts a mix version the song will appear within the public mix directory, and the associated project page for playback. Stem Tracks: An individual solo performance audio file. For example, a solo guitar piece, solo vocal melody, solo piano, which can either be mono or stereo. An uploaded stem track in raw state will only be made available for the user that has uploaded the file, or the group and project members that the file has been assigned to. When a user posts a stem track, the file will be displayed in the public stem tracks directory. Scratch Track: A single or multiple voice performance audio file that represents an idea for which the artist posts to the community for feedback, response and potential participation in the songwriting and recording process. The Scratch Track can be designated to a project within the audio management section of MixLuv, and can either be a stem track or a mix audio file type. There are four simple steps that an artist can take to initiate a project and engage with the community for collaborative purposes. Upload a scratch track. The artist posting a scratch track, is by default the project admin, and has the ability to upload a scratch track of their own to the community for feedback and collaboration (i.e. a solo guitar track, a guitar track with vocals over it, or even higher level multi-track audio file). This scratch track will serve as a means for other musicians to discover, and collaborate with the artist on a particular project. The file designated as scratch track will be available within the projects pages section for all users to provide feedback by messaging or upvoting the scratch track itself. When the project admin posts a scratch track, they will have the opportunity to select the additional musical components that he / she is seeking from the community to fulfill and participate in the song collaboration. The project admin does not post examples of the specific desired musical voice components, but merely states in the project post to the community that they are seeking such musical voices, and appropriately identifies the components. Set as Scratch Track - Only available for projects where you are an admin. Edit - You can edit audio files that you have uploaded, and audio files of projects where you are an admin. Assign - You can assign audio files you have uploaded to any project where you are an admin or a member. Post - You can post an audio file mix version to the MixLuv platform for streaming playback of projects where you are an admin. Audition - You can select audio files of projects where you are an admin and audition those audio file against the project scratch track. Lock - You can lock audio files of projects where you an admin, that are considered final for mixing. 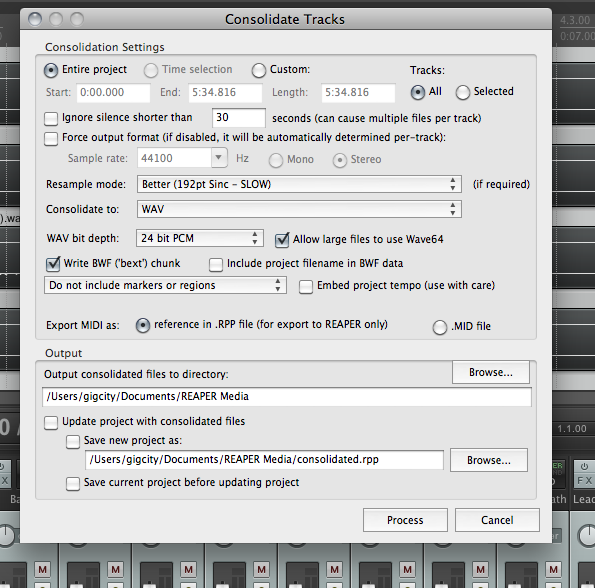 Post - You can post tracks that you have uploaded which are not assigned to projects for final mix consideration. Raw: An audio file that is designated raw will only be visible to the user that has uploaded the audio file within their repository. Once the file is assigned to a group and project, the associated members of the group and project will also have access to playback and download the audio file. Scratch Track: Any stem track or mix audio file can be designated as scratch track for a project. This designation will set the audio file in place on the project page for community feedback. There can only be one scratch track per project at a time, and it can be swapped out at any time if a new scratch track is needed or a separate part of a song has been developed. Audition: This state is a multi-track playback environment designed to allow group members to playback audio files against each other to develop and build out the song with one another. 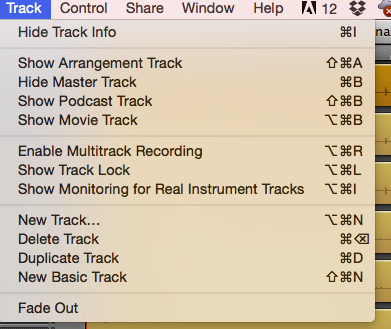 There is currently mute and volume control for each individual stem track that is moved into the audition state for playback. A stem track that has been determined to be a viable candidate for the song collaboration by the project admin who has set it into place for the project mix-down state. Upon locking a stem track into a requested component slot, the audio stem track will be available for project user feedback, and for public playback on the project page for non-logged in users to listen to and up-vote ‘Luv’ (non-downloadable). This locked state can be removed from a stem track, wherein the audio file will go back to raw state, and will not be visible to the public. Any artist that has been invited to collaborate on the project will be able to listen to all submitted material. Once a project has all components locked into place, the project members are encouraged to download each stem track for mixdown purposes, and upload mixed versions and post to the MixLuv platform. What is this Splits stuff? So you have a few rights as a Songwriter and as a Recording Artist. Through MixLuv, your Project is actually considered both a ‘composition’ (PA copyright) and a ‘sound recording’ (SR copyright). The composition (the underlying lyrics and music protected by the PA copyright) is jointly owned by the Project collaborators. From a legal standpoint, the collaborators must agree on the percentage they will apportion or ‘split’ the composition. ‘Song-splits’ are completely up to the authors - there are no rules or laws on this. MixLuv will do it’s best to help facilitate this splits discussion between Authors. We will also share customary practices and advice on how this is typically handled. The final sound recording (SR copyright) is also owned by all involved in the Project. 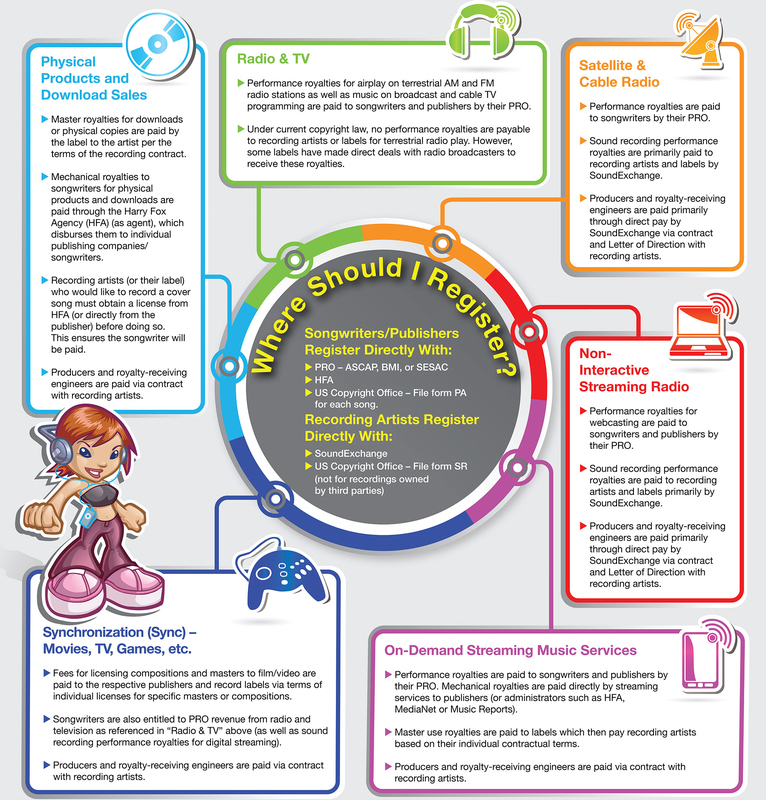 The sound recording revenue (explained below) is based on mechanical sales and sound recording performance royalties. Without clarification on ownership of this right, you really cannot take advantage of this revenue at all. Why is all of this in MixLuv? It’s better to be aware of these models up front and to start these discussions early in a Project. As the project evolves, adjustments can always be made. So even though we have some exciting things coming into play later, discussing splits with your project collaborators can save you a lot of headache later. There are numerous ways in which a musician receives revenue. As a Songwriter (PA), the artist must register each song with a Performing Rights Organization (also known as a Performing Rights Society), a Mechanicals organization and the copyright office. In the US that means ASCAP, BMI or SESAC (PRO) Harry Fox Agency, (mechanical) and the US Copyright Office . Note, each country has it’s own set of agencies. As a Recording Artist (SR), the artist must register each song with the appropriate agencies - In the US that’s Sound Exchange and the US Copyright Office . Note, each country has it’s own set of agencies. The following Infographic clearly explains the numerous income sources for musicians in the US. Synchronization licenses are licensing fees paid synchronize the composition and the “master sound recording” to film/video. These fees are typically paid to Publishers for use of masters or compositions. If you do not have a publishing deal, MixLuv will soon be able to work for you as a Publishing Administrator. You keep full ownership of your songs and can re-assign Publishing Administration whenever you need to. On-Demand Streaming mechanical royalties, streaming services pay Publishers directly. In order to take advantage of that revenue, you need to have a publisher in place. Once again, in the future, MixLuv can function as Publishing Administrator and help you to take advantage of that income. Why should I register with a Performing Rights Organization? Performing Rights Organizations, on behalf of songwriters, collect income from radio stations, venues, and TV networks for the public broadcast of your composition. The PRO collects your performance royalty and distributes it to you. Why should I register with a mechanicals agency? A mechanical license is needed if one wants to manufacture and distribute recordings that he or she did not write. This license is needed for physical works, digital downloads, ringtones, interactive streaming, and other digital formats. In the US Harry Fox collects your mechanical royalties for you. What’s coming from MixLuv down the line? Mixluv is working on a few very exciting partnerships which will significantly help you to protect, distribute, and monetize your music. Our engineers are looking at how we can utilize audio fingerprinting to make sure that your songs cannot be plagiarized or stolen. We are also looking at how we can help to streamline song registration with the Copyright Office and Performing Rights Organizations. We are also working on partnerships which will allow for distribution to 100’s of digital stores and streaming services. With this services, we’ll also have a streamlined online sales revenue reporting system. Finally, we are looking at creative ways that MixLuv can help you secure sync licensing opportunities. We’ll make sure to update you regularly on this. We are very excited about these future capabilities. Basically, any compression is going to lower the quality of your music. Voila! You’re ready to upload your scratch track or mix. Each track now shows a new button with a lock icon. 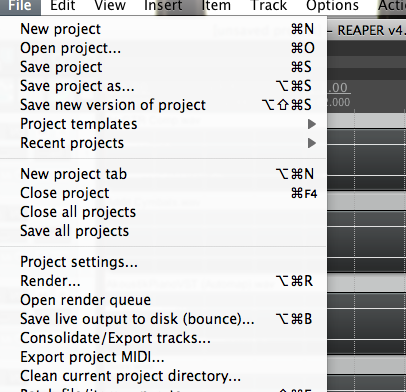 Click on each of these buttons so that lock is on for every track in your project. 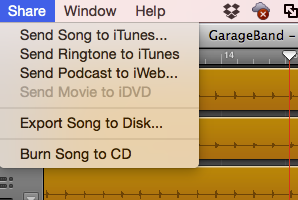 GarageBand will create the audio file the next time you press “Play”. 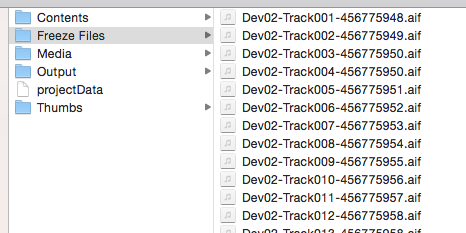 Under the ‘Freeze Files’ folder, you’ll see all of your Stem Tracks as AIF files! You have many options here. But here’s a basic configuration that will get you started. Select ‘Master Mix’ as your Render output, Select ‘Entire project’ as the Render bounds, Pick your Directory and File name, set Sample rate to 44100, set Resample mode to “Better (192pt Sinc -SLOW)”, set Output format to ‘WAV’ and click on the ‘Render 1 file’ button. Select Entire Project, Select All Tracks, Deselect Ignore silence shorter than 30 seconds, Set Resample Mode to “Better (192pt Sinc -SLOW)”, Set WAV bit depth to 24 bit PCM, Select Allow files to use Wave64 and set your output folder.